The new Case IH Farmall JXM Series tractors deliver the power and performance the owners expect, all featuring the distinctive Case IH premium design. These tractors meet the demand for rugged yet comfortable and easy-to-operate equipment and are equally suitable to all types of farming businesses, from utility tractor to the flagship tractor in a small farm. The two models come in either a 2WD or 4WD version and feature a wide range of transmission options. Farmall JXM tractors are designed for compliance without compromise. The 90 horsepower models will provide all the power you need for rough spots and tough jobs, as well as better engine performance and fuel economy. Outstanding horsepower in its class to handle tough conditions: this is what we at Case IH mean by productivity. The new Farmall JXM tractors are powered by the proven 3.9L turbocharged and intercooled four cylinder Tier 3 engine which offers class leading torque and provides reliable power, day in, day out. Its simple and robust design results in trouble-free,long-life working, and reduces maintenance requirements. The Farmall JXM Series has an amazing array of transmission options to create the perfect tractor for your operation and needs. A heavy-duty, compact frame, durable components and plenty of power to the PTO makes it a pleasure to pull out of the shed every day. Farmall JXM tractors are available with a wide choice of transmissions so that it is easy to select the right specification to meet your requirements. You can choose from either a 12x12/8x8 synchro transmission with creeper options, a 12x12/20x20 mechanical transmission or a 12x12/20x20 Power Shuttle transmission. 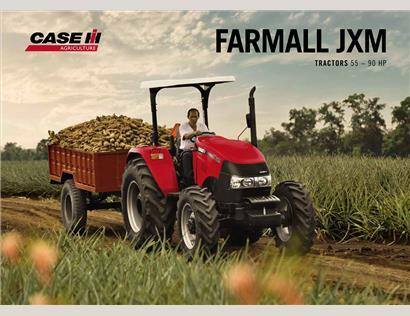 The Farmall JXM tractors are built for implements, and the hydraulic system handles them with ease. With its rugged design, heavy-duty frame and tough components, your Farmall JXM will deliver outstanding maneuverability and stability in the toughest operations. The robust rear 3 point hitch is capable of lifting and handling implements of up to 2,500 kg with ease. Depending on the nature of your work, separate levers allow the setting of hitch position and draft control for soil engaging implements, or any mix of the two. Thanks to its proven and durable design, the heavy-duty rear axle, transmits high power and torque, quietly, efficiently and with minimal power consumption. Its special architecture also allows a longer brake life for extended safe operations. A flat deck ensures that the controls are positioned for easy and comfortable mounting and dismounting and the layout optimises the ergonomics for greater operator comfort. The suspended brake and clutch pedals are also ergonomically placed for ease of use.